If you would like us to provide your practice, surgery or department with our information leaflets please complete the request form below. Would you like to receive our most current information and offers by e-mail? Enter your e-mail address here to sign up. The SleepRight dental guards are the only occlusal splints approved by the British Dental Health Foundation. Find out more. Introducing the world's leading oral appliance for bruxism, snoring and sleep apnoea. Read more. The on-line source of information about teeth grinding. 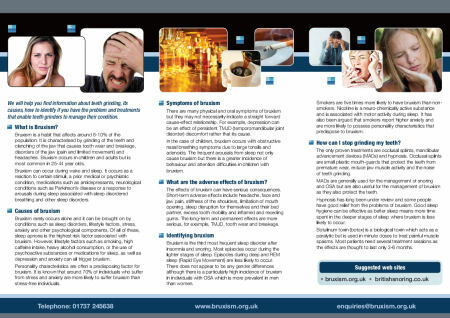 Find out more about the causes, symptoms & treatment options for bruxism. Contact Us.